4,4,5 - 4,5.........Bingo von Ellendonk. 4 - 4..................Cona von Niederkassel. 5 - 5,5...............Guys Hilo vom Norden Stamm. 5 - 5..................Biene von Niederkassel. Banjo vom Eschenbruch passed the Körung 'for life' with highest possible ratings for courage and working drives (very high fighting spirit, courage and hardness with middle sharpness) and lived to 10 years of age. His litter-brother, Ben vom Eschenbruch, passed the Körung 'for life' with Körklasse 2A rating while his sire, Cöbes von Warringhof, competed in the D.V. Meisterschaft and passed the Körung 'for life' with highest possible ratings for working drives. Banjo's maternal grand-sire, Gero von der Mooreiche, was twice runner-up at the D.V. Meisterschaft and passed the Körung 'for life' with highest rating for hardness and working drives. Bandit: IPO 3, IDC-Leistungsrüden and passed the Körung with Körklasse 2B rating. 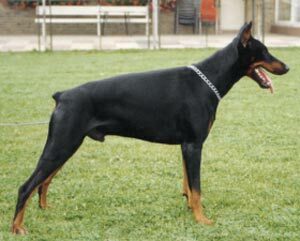 He is sire of the vom Eschenbruch “T” litter.